If you you need some extra income then there is no better way then online jobs. There is no investment to start an online jobs & you can work from your home, office or any convenient place. In fact, thousands of people in India are earning full time income from online jobs. It's the hottest trend in India. One of the beauty of this online jobs is that you don’t need any qualification or technical knowledge to start any of the job. Here I will show you some of best & simple online jobs that can pay you up to Rs. 50,000 per month. You can work part time or full time. We have provided complete guide for each and every online job. Get paid to complete offers is the most simple online jobs available for Indian. Here you will get paid for completing short and simple tasks. You can earn 5 cents to 1 dollar (up to Rs 60) for completing tasks like signup on a website, following a FB page, watching a video, downloading an app, completing a survey etc. There are many popular G-P-T sites where you can signup as a worker and start earning immediately. I have been working part time on G-P-T sites for more than 2 years & making more than Rs. 25,000 per month. I will show you only popular sites that pays much better than other sites. You can make minimum Rs 10,000 working 30 minutes per day with these sites. It’s more than 8 years I would know about this ad reading job but I started working on this online job just 3 years back. I was always ignoring the earning from this type of job because of low earnings but you will be surprised to know that I am making more than Rs 50,000 per month from this online job. I have got very good experience of working on paid 2 click sites (P-T-C sites) and I will show you tips & tricks to make money from these sites once you signup. Blogging is my most favourite way of making money & whenever someone ask me about online jobs then I recommend blogging only. More than 70% of my income comes from blogging only. In fact I make 40% of my total earning through my blog MoneyConnexion. So if you are thinking what this hell blogging is, then I will explain you in layman language “just create a website & publish some useful content in your website on regular basis”. If you check this blog then you will find that I am publishing regular content related to ‘make money & similar topics’ on this website. Yes, this is blogging only. You create a website, start posting articles on a particular topic (your favourite topic) & start earning money. Uff…so how can someone make money by creating a site & simply posting content. 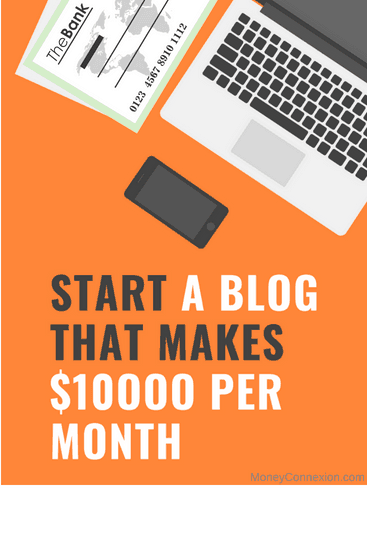 There are various ways to make money from your blog. Google AdSense & affiliate marketing are the most popular. My favourite is Google AdSense & I almost make 7 figure income from AdSense. You can take blogging to next level by becoming an affiliate marketer. There is no limit to how much you can make with affiliate marketing. However, before you become an affiliate marketer you have to build your own blog first. Here, you are going to sell products to visitors coming onto your blog. The best part is you don’t have to create or manufacture products. You will be promoting products on other’s behalf. You just have to join an affiliate network, choose some of the best affiliate products close to your blog’s niche, start promoting it and earn commission on each sale every single day. Affiliate marketers in India are easily earning Rs 100,000 – Rs 500,000 per month easily. Signup with some of the popular affiliate networks like Amazon India, Flipkart, VCommission & international networks like CJ, MaxBounty, ImpactRadius, ShareASale etc. YouTube is becoming biggest source of online jobs for Indians. Hundreds of Indian YouTubers like Technical Guruji, Nisha Madhulika, The Viral Fever, All India Bakchod, Wow Kidz, FunkYou are earning in millions. And thousands of small & medium YouTubers are earning up to Rs. 1 lac per month through this online job on YouTube. You can create all sorts of videos, upload them and make money. YouTube Partner program allows you to showcase your talent through videos and earn money for the number of views your videos receive. Create excellent quality videos that people will love to watch. You get paid for each 1000 views by the Google. So you have to get thousands and even millions of views for each video. Indian YouTubers can easily make Rs 20,000 to Rs 200,000 per month depending upon the quality of their content. Those of you who can write then there is no better online job than writing. You can become a freelance writer through various freelance sites mentioned here. If you know there are thousands of freelance writers around the world who are earning a decent income writing online. In India, you can easily earn up to Rs 35,000 – Rs 40,000 per month writing online. If you are a writer who can write simple English with no grammatical error then there is no dearth of writing jobs online. Online surveys are a great way to make Rs 10,000 to Rs 20,000 per month working just 2 – 3 hours a day online. Usually surveys are conducted by various companies to ascertain what consumers think of their product and services. Companies want to know whether they liked their product or not. Hence, they need people like you to share your opinion with them. These companies outsource their work to various third parties and these parties provide you survey jobs where you need to fill a form containing simple questionnaires. You need to answer these questions. Each form has few questions in them that can be finished in 5 – 20 minutes depending upon number of questions being asked. That’s it! But there is one caveat, finding a genuine online survey sites could be a daunting task. But don’t worry, we did it for you! On your part do thorough research and background check of each site before joining this type of online work. DO NOT JOIN A SURVEY SITE WHERE YOU HAVE TO PAY A MEMBERSHIP FEE! Genuine sites do not ask for payments. I personally know many of the people who are selling different products on sites like Amazon India, eBay India etc. and earning anywhere between Rs. 20,000 to Rs.1,00,000 per month. It’s not a difficult job. Anyone can become an online seller and make a profit. You can do part time or full time. Look for some local dealers or distributors where you can find some hot selling products at lowest price. Signup as seller on Amazon, Flipkart, eBay or these 60 online shopping sites. List all your products on the sites with the selling price. People always check reviews before they order any product on shopping sites. Try to provide the best services to your buyers so that they can write good reviews about you & your products. This will help you increase the sales. There is nothing new about online Data Entry Jobs. You have being listening about them since you discovered Internet. So they are plenty. Finding a genuine Data Entry job which pays you on time regularly could be very challenging but we made it easier for you. 2 things you must remember while searching data entry work online. Never pay a fee for joining a data entry company. Secondly do a thorough background check of the company you would like to work for. Go to their Contact Us page, see if phone number is given, dial them and ask every small detail about the company. In fact pay a visit to their office and talk in person. Earning Rs 10,000 – Rs 25,000 per month wouldn’t be that difficult with this online work. Go ahead! Usually people confuse transcription jobs with data entry work. Indeed, they both are quite different. In transcription you listen to audio/video files and convert them into a word file. Transcription services are often given for medical or legal (mainly medical) purposes. The job is quite demanding because you need total control over medical and legal jargons. You must have some prior experience transcribing audio/video files. Moreover, your typing speed must be over 60 words per minute. However, you are paid well as a transcriptionist. A transcriptionist makes 4 to5 times more than a data entry worker. In India, you can find genuine online transcription jobs if you are willing to do some research. Salary of a transcriptionist is really good. Here you read from the image and write it down in the box given below. There is a very huge demand for Captcha entry workers in the market. Earlier companies and individuals were creating thousands of accounts daily on different sites. They automated this process by using software or robots. In order to prevent this act, Captcha was introduced so that only human beings can open an account at a given time and not robots. Hence, to solve thousands of Captcha manually daily these companies needed workers like you urgently. So Captcha Entry work is outsourced to people like you. In India, you can easily earn $1 to $2 for solving 1000 Captchas. If you work for 3 to 4 different sites then you can easily earn Rs 8000 to Rs 12,000 per month with this online job. Online jobs like Data Entry work, transcription jobs, survey jobs etc can’t be called as freelancing jobs. You have to be master in just one field. You can’t do all these jobs at once. For example, you can’t be a data entry worker and transcriptionist at a same time because both of these online jobs are demanding. But freelancing jobs are quite different; you can do many jobs at any given time. Freelancers do various jobs like writing articles, designing logos, graphics design, web development, creating videos, marketing all at a time. Freelancers do all these jobs on and off basis. They are jack of all trades but master of none. You can join these freelance sites and start earning money now. Unlike previous few online jobs, digital marketing are quite new to scene. In last 5 years, they have become quite popular especially among younger generation. There are two great things about digital marketing jobs, first one is you can do online and second is remuneration, it’s really great. Right now SEO jobs are in very high demand and selling like hot cake. SEO experts those who know their work are earning decent money working online. Digital marketing can easily pay you Rs 10,000 – Rs 35,000 per month. If you find digital marketing jobs tough then you can look out for social media jobs. Here are some of them. 1. Virtual Assistant: As a virtual assistant you will assist managers and executives online with tasks like organizing files, answering phones, managing files etc. Knowledge of MS Office, Google Apps, Dropbox is very important. 2. Social Media Managers and Moderators: Social media managers and moderators manage social media platforms like Facebook, Twitter, YouTube and other online forums/groups. You assist visitors, respond their comments and feedback, delete inappropriate comments and manage threads. 3. Chat/Email Support: Instead of calling from phone, you will reach out customers through online chat and email. You will be paid for assisting people online by chatting and email support. You are paid well for each online job and earn Rs 12,000 to Rs 25,000 a month depending upon your experience. You can find social media jobs on job portals like Naukri and Indeed. Online tutoring jobs give you an opportunity to make some extra money right from your home. Especially, if you are a college graduate. The best thing about online tutoring is you can teach students on part time basis. Just 2 to 3 hours a day is enough for earning Rs 10,000 – Rs 20,000 a month. You must have some prior experience with teaching or tutoring. Concept of mystery shopping is very new to India. Big companies want to know what consumers are saying about their products and services offered by them in different stores across the country. So they hire mystery shoppers like you who will find out people’s opinion about their shopping experience. As a mystery shopper you are required to eat in a restaurant, buy products, test a service, drive a car etc. One important skill you must have is a good writing skill. You write for big companies through third party organizations. You can easily earn Rs 10,000 to Rs 25,000 per month as a mystery shopper. You also get an opportunity to write for magazines and newspapers. So act now! Buying and selling domain names is a proper business that can be done online. You buy a domain name for a lower price from Go Daddy or Host Gator and sell it for a price 10 to even 1000 times higher than the buying price. Many domain buyers and sellers have become millionaire by doing this. However it needs some experience. You must be smart enough to buy a domain with a name that is going to be popular in future. You have to think like an investor. Which businesses have potential to grow in future? You need to choose a name resembling that business and book a domain name now. In future when the demand for the business grows you can sell it for a much higher price. Buy a domain with right name now! Sell photos taken from your smartphone and get paid for each single photograph. You can use your photography and selfie taking skills to make some money from this online job. You have to take professional looking photos from your smartphone and sell to websites like Shutterstock, Fotolia, iStock Photo online. You don’t even have to buy a camera because today every smartphone comes with a very powerful camera. Each photo can pay you anything $0.25 to $30 depending upon the quality of the photo. However, you must remember taking photos are not as easy as taking selfies. Hence, photos must look professional in order to sell them. You just have to download and install apps like Foap, Twenty20 etc. onto your phone and start selling photos. Last but not the least is stock trading. You can trade stocks online and earn money. Intraday traders earn huge profits trading not just stocks but commodities and currencies too. Although you can make great money trading however it is not for everyone because a lot of risk is involved here. If you have a good knowledge about the markets then you can create an account with a broker and get started. Everything is done online on your laptop. You buy shares for low price and sell them high. Whether you earn money or lose it, the amount is credited/debited to your account online. There is no limit to how much money you can make with trading. So these were 18 best online jobs in India that you can join now. You can choose anyone of them and get started. But before you get started I would appeal to do thorough background check of the company you are joining for any type of online jobs. Looking for Genuine online form filing home based work in india or from abroad, please share contact or websites. Also small request to personally meet you. Read the information provided by you and looking forward to start writing a blog. I am not very sure about creating a website and web hosting part. Can you please help me with this part?? Can we write a blog for some already existing website and get paid?? How bloging and writting (3 and 6 in this list) could help and I need to know the basic procedure… How to create a blog or Write about some particular topics..
Sir, If i join ur ad posting job today or tommorrow then when i will start earning how ca i get the profits in $ convertd into indian currency, what will be the charges and if it grows bigger what i should give explanation to the bank officials. I want to earn through home base online jobs. Could you pls inform me that what are the basic requirements for this type of doing home base jobs. Also I want to know how much amounts I have to invest? After that any guidance will be provided or not. And really freshman can get money monthly basis? HYE. I read ur msg u wan to earn from home thn first u have to be very calm by mind nd ur heart nd ur timing is very important for this online job.iof u hav any dought or quary u may contact by mail. Thnx for apply this job mow u r in. time for online job.I am very fast in typing. Thanks for inform, am passionate to work online. I just want to choose the appropriate job according to my abilities and who Iam. Thanks. Right now I am working now online upwork.com for the last one year, its tough to find projects as a SEO / blogger / content writer / rewriter. I get $ around 400 to 500 hardly. That comes to my Indian account (SBI) directly with a very less commission for their transfering (better than paypal actually). Hey! I have $800 investment for Neobux, and I want to really accelerate my way to $100/day. What strategy do you suggest? Also, can we do something like a phone consultation or email/skype consultation for an amount we decide upon, to discuss a strategy in detail? I’m from India as well and can converse in Hindi/English. Nice piece of valuable information. Thanks. Yes Shobha, you receive money in INR in your bank.